Where are the missing kids? I am taking part in the #blogging4madeline campaign this year. Yes, I can just hear some of you sigh, begin to switch off and think about clicking away, but just wait a minute and spare a few minutes for the kids who have all gone missing, including Ben Needham, April Jones and many other nameless and faceless children. What if they were your children? If your children had been taken, no matter what the circumstances, would you click away then? This isn’t about the parents, or the press, or the stories of who did or didn’t do anything right or wrong. It’s about the children and nobody else. I have watched people crucifying April Jones parents for having her out playing late at night, or the McCann parents for leaving the children alone, but neither of those things changes the facts that the kids are still missing. I think that we would all clutch at hope of any kind if our children went missing. I’ve accepted that I don’t have to agree with what parents might or might not have done to offer my support with helping to find those missing kids. I’m posting for the kids. Madeleine went missing from Praia da Luz, Portugal on Thursday 3rd May 2007. 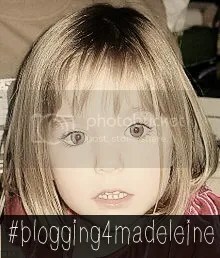 I agreed to join the blogging4madeleine campaign to raise awareness that Madeleine McCann is still missing and to spread the word about her and the other missing children around the world. There are thousands of children missing from the UK, but far too few people know about any of them. The Child Exploitation and Online Protection Centre (run by the police) operates a website called Missing Kids UK that shows many of the children who are missing. I’ve added their widget to my blog footer. If you want to add the same as mine which is smaller than theirs, the code is. Why are we posting now? Children deserve not to be forgotten. There are thousands of British children missing. Madeline McCanns birthday is the 12th May 2013. She would have been 10 years old. The 25th May is International Missing Childrens Day. Get involved over on Facebook. Contact information to report any sightings or information of Madeleine and other missing children. This is what Madeline could have looked like at age 9. If you’re interested in joining the #Blogging4Madeleine campaign please contact CJ from A Mummy’s View blog via Twitter, Facebook or by emailing amummysview@gmail.com. I’ll leave you with part of the message from Kate McCann on her website which stated that most children who are missing in the way Madeline was are for sexual exploitation. I found the statement she made further on very disturbing. I too can’t imagine how not finding a child that has gone missing would feel. I’ve only lost mine for seconds when they were small and that was bad enough. You are so right. When people start pointing to Kate and Gerry McCann, and what they don’t like about them, I get really frustrated. A 3-year-old girl was taken. It’s not her fault her parents aren’t popular. It doesn’t mean she shouldn’t be found. And frankly, whatever her mum and dad did, I think they’ve been punished enough for leaving her in that apartment. No matter how much we say they were wrong – I’m pretty sure they’re beating themselves up about it too. I think it should be about the children and not about the parents, but the newspapers and articles seem to mostly focus on the families rather than the actual missing children. So important to highlight ALL the missing children. Today I have experienced utter hatred and vile things being said about the parents. As you say, it’s about the children. They are the innocent victims in all of these tragic cases. I pray that she is found and that the McCanns are able to find closure and some peace at last. I think the focus shifts too far from the kids and it’s important to get it back a bit. I’ve seen a few of you blogging for Madeleine today and I hope it helps to jog someones memory somewhere. As do we. So many missing kids all over the world. Thanks for commenting. Its unimaginable and a pretty tough punishment for trusting your child will be safe. When I was younger I was all over the place on my bike and lucky. I really hope the outcome is that she escapes like the Cleveland girls and others! From the age of 5, I walked to school and back without a care, but I knew every person in every house along the way. Nobody knows anyone now and I’d never have let my kids walk to school at that age now. I hope she finds her way home. Well done to everyone taking part in raising awareness on her birthday. So many missing children and so many empty spaces in the lives of families waiting for them to come home. What an insightful and thought-provoking post. Thank you for participating in the #Blogging4Madeleine campaign. It’s such a shame that the children get forgotten about whilst the media are quick to shoot the blame at the parents (usually the mother). Thank you for shining a spotlight on what really matters. The child. 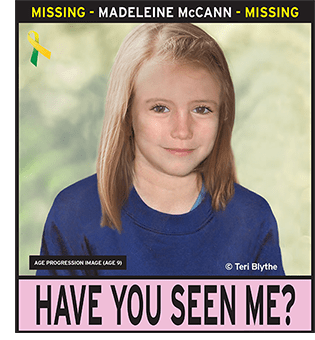 Let’s hope Madeleine and the other countless missing children are found safe and well soon and returned home to their parents. I think so, we hear more about the parents now than we ever do about the missing children which is so sad. God I really hope that little girl is still alive, but then what she must be going through I don’t dare to imagine. It’s the single most cruelest, most evil thing in the world – the exploitation of children. How unbearable of her parents – how can they ever grieve, never knowing if she is alive or dead. And that quote really disturbed me. Ps. if she was found – what kind of psychological state will she be in. This makes me cry for all the lost children – how sick can mankind be. It’s the thing that seemed to hit me more when I had kids. I always knew it was going on in the background somewhere, but since the Internet went so wide, it seems to just be worse and worse.